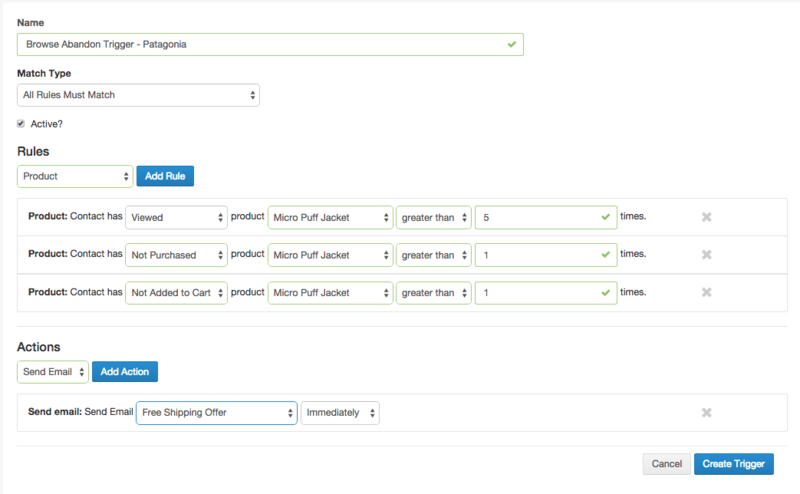 Triggers enable you send one-to-one messages based on the actions your customers take on your webstore. Brand– trigger an email to be sent when a contact has viewed, purchased or added a product in a particular brand to their cart. Frequency– trigger an email to be sent based on the number of times a customer has ordered from your store. Monetary– trigger an email to be sent based on how much a customer has spent. 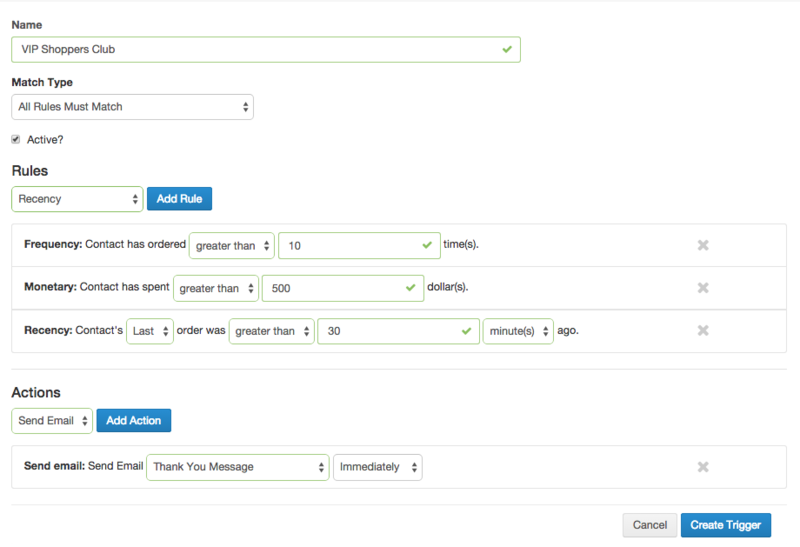 Recency– trigger an email to be sent based on when a customer placed an order on your site. Shopping Cart– trigger an email to be sent when a shopping cart is created, completed or abandoned. When creating your trigger rules, be sure you have the correct association for Match Type. All Rules Must Match acts as your 'and' rule. Any Rule Matches acts as your 'or' rule. How you use triggers is entirely up to you and what type of customers you want to convert. But the more detailed you get, the more powerful and personalized the message will be. Here are a few examples. Browse Abandonment: Set up a triggered email to be sent after a customer views a certain product more than  times. If they keep returning to your store to look at the same item, they probably want it, but are waiting for the price to go down first. So help them make the decision and have a triggered email ready to send after their 6th view – include an offer or promo for the product you know they want. High Value or VIP Buyers: Create a trigger for your high-value VIP shoppers. These are sometimes your most valuable buyers and you want to thank them for their loyalty. Set up a triggered event to send a thank you email after their [10th] purchase from your store. This will show them you care and keep them coming back no matter what competition may throw their way. What products a customer has viewed? How often they have viewed a particular item? How often a consumer visits your site? How much they spend when they make a purchase? When they have created, completed or abandoned a shopping cart? With Kevy, you can set up a dedicated workflow or email series. This enables you to create drip campaigns based on unique behavior or order data. For example, you may want to send a Welcome series to every new customer that joins your Loyalty Program list. To do this, your rule will be the List rule. So as soon as someone is added to your Loyalty Program list, you can trigger a welcome series. In this example, you have 3 emails scheduled to send. The first is sent immediately after the contact is added to the Loyalty Program list, the second is 7 days after being added, and the third is 20 days after being added. All new contacts added to the specified list will receive the same series automatically. 1. Is the time period based on the previous action, or when the trigger was met? The time period set for each Action refers to the time the contact met the rules specified. In the example above, the emails will be sent 7 and 20 days respectively, after the Rule is met. 2. Can you set both 'AND' and 'OR' rules? No, you must select only a single match type.